The Sahara Desert is a spectacular place. I’ve commented elsewhere (and repeatedly) just how much I love deserts, and how much I love wild places. I won’t go into that again, but that goes a long way to explaining just how special the Sahara is. I’ve got a number of memories from the Sahara. It is, of course, a vast terrain. The largest tropical desert in the world (Antarctica, a cold desert, being the largest, and a place I have yet to visit), in fact only a small portion of it is covered in the sand-dunes which we so frequently associate with it. Most of it is bare gravel plains- on the one hand a barren, dull and numbing landscape, but somehow too all the more brutish and hostile- and therefore exciting- for it. The boundary between Sahara and Sahel (that vast biome larger still than the desert, a semi-arid savannah landscape of mixed brush, grassland and thin forest that stretches into Africa south of the Sahara proper) is a blurred one, so it’s sometimes hard to know where Sahel ends and the Sahara begins. I think of rutted sandy tracks through the mixed woodland of south Darfur, of gravelly volcanic plains spotted with tufts of sun-bleached grasses in Kenya’s Turkana district, and of the single roadway snaking west to east across the empty expanse that is southern Niger, lifeless dusty plains mixed with scrawny millet fields and ephemeral stream-beds lined with trees that grow verdant with brief, sporadic rains. The Sahara itself is more obvious. I recall watching the sandy ridgeline on the horizon that seemed to follow us for hours on the road northwards to Gao, in eastern Mali. The dunes that rose on the north bank of the Niger River as we drifted slowly by on a wooden canoe for several days. The white dune sea that covers the land north of Tomboctou’s outskirts beneath a sky equally white with heat-haze. Vast gravel plains pocked by violent, distorted outcrops of rock in central Mauritania, bulging in a lens of shimmering hot air. 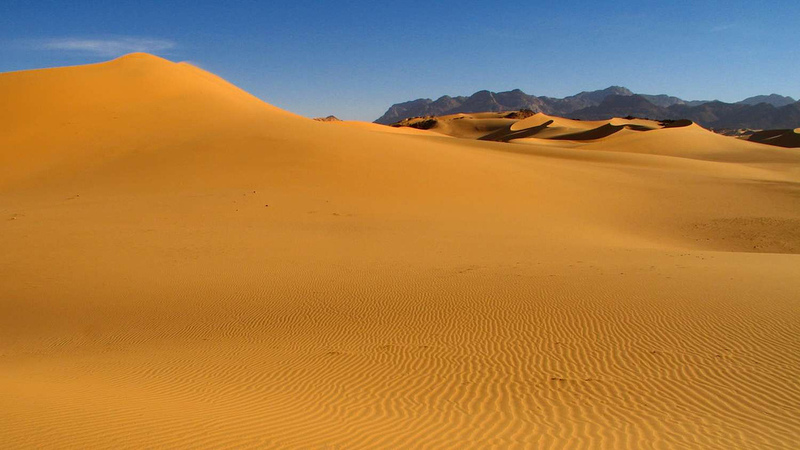 But it was my first experience of the Saharan dunes that really took my breath away. Four-wheel driving north of Agadez, an area now off-limits to tourism due to the threat of rebel activity and landmines, we drove first to Iferouane, where we spent a night or two, and then onwards up sandy wadis as the landscape grew more and more devoid of the signs of human existence. Rocky outcrops, the edges of the Air Mountains, stuck up from plains of dust like broken towers. The sky was crystaline blue and the air clear and sharp, dust blowing in our wake. We saw camels and thorn bushes, the only signs of life. In the late afternoon we reached the dunes. Stopping the vehicles, we piled out onto the golden sand, leaving our sandals within paces of the car doors. Like children at the beach we raced each other up the dunes. I remember sand between my toes, hot on the surface and cooler beneath. I remember a sense of awe at the sight of the sea of dunes that spanned out before us, walled on one side by the spectacular ferocity of the mountains. In the low afternoon sunlight the faces of the dunes were turning a golden yellow colour. Their ridges were traced in dark contrast, the beautiful contours of windswept shadow. I took photos. Ad nauseum. I hadn’t yet- and haven’t again- been to a landscape so intense in wild beauty, so photogenic, and so unspoilt. Within hours of our departure the next day, wind would have erased all trace of our footprints and tyre tracks, and the grumble of our diesel engines would be replaced by the murmuring of a warm, restless desert wind. The dunes at Tizirzak were my baptism into the Sahara desert, the fulfillment of all my Lawrencian hopes and expectations (T.E., not D.H.). Few times have landscapes exceeded the vision I had for them in my mind’s eye, and indeed the beauty of the Sahara itself can be an elusive one- many days of emptiness for a few short hours of revealing beauty. Without a doubt, however, the beauty carried in the great sand dunes of the Sahara is the match of almost any scenery on earth. I continue my plotting to return to that corner of the world once more and soak in the wild beauty of that harsh, arid yet ever enticing desert. I have been revisiting some of my old travel writing, from long before these pages were a twinkle in my eye. These were pieces I wrote for friends which I emailed around- and got promptly told off for being far too wordy. Nothing changes. I thought I’d add some of them to this site and let you wander through some of my journeys past. Last night I dreamt I went to Nouakchott again. Actually, it was last week. And it was more of a waking nightmare really. It was with a certain amount of trepidation that I headed off to the airport. I haven’t heard many wonderful things about airlines in West Africa, and this time I was flying with some of the old favourites- Air Burkina, Air Senegal, Air Mauritanie- and with a corker of an itinerary that saw me going from Niamey to Ouaggadougou, Ouagga to Bamako, Bamako to Dakar, then an overnight in Dakar before flying on to Mauritania the next morning. (West African airlines operate a lot like bus companies- they just swing past and stop at as many different places along the way in the hope of attracting passengers). It sounded like such fun I just couldn’t wait. But I got to the airport at two o’clock on a stifling sun-seared Saturday afternoon, and the Air Burkina Fokker Fellowship managed to make it into the air without too much complaining. There is always a sense of incredible faith in the laws of physics when strapped into some of these aircraft, an acute awareness that what you are doing is ever so slightly at the edge of what ought to be possible, that you are effectively in a controlled hurtle skywards and hanging from a very fine thread while flaps and ailerons and elevators try and keep you from settling into an easy tumble. The safety briefing before take-off consisted of pointing out the exits and directing people to the emergency card in the seat-pockets; one is not filled with a sense that people would know what to do if anything serious happened. But despite all, we touched down safely in Ouggadougou, and it was hot and dry, and trouble kicked in. Antigua is a pleasant and peaceful little town. Heavy on tourism, the central area is a grid network of narrow streets arranged about a central plaza, home to a grand and intricately-worked cathedral, and walkways covered by colonial archways. Rich in atmosphere and history, and overshadowed by looming volcanic cones, it’s well worth a visit to anybody passing through this delightful Central American nation. Golden light from an evening sun catches in the smooth-flowing waters of the mighty Niger River. During the rainy season (when this was taken), the river fills a broad plain nearly a mile across , swallowing ephemeral islands and swamping fields along the banks. At the peak of the nine-month dry season, it constricts into a narrow channel just a dozen metres wide in places, impassable to boat traffic, and so insignificant that herders drive their cattle across it on foot, forcing them to swim just a few seconds where the flow has all but choked to a standstill in the fierce heat. From Niamey’s Grand Hotel, the view over the river at dusk and the surrounding countryside is one of the perks in a city that is largely devoid of them. Hot, dry, dusty, and the capital of a country that frequently takes bottom place in the UN’s list of underdeveloped countries, Niamey has the feel of a village of a million people. It is an isolated island in the middle of the Sahel, landlocked and generally ignored by the rest of the world. However it is a gentle place, incredibly safe and very relaxed, and with a number of locales where a meal and a cold beading Biere Niger go down extremely well. Many things about Niger I do not miss, but I would gladly find myself in Niamey for a quiet evening out with friends once again. The Niger River is one of the world’s great rivers, providing a vein of life that cuts through West Africa’s southern Sahara region and connecting a network of cities and civilizations that once flourished here. Nearly 4,200m long, it rises in the hills of Guinea and Sierra Leone, just a short distance from the western Atlantic coast of Africa. From there it flows counterintuitively inland, carving a path through the interior of West Africa, and then arching its way deep into the Sahara where it reaches its zenith near the ancient city of Tomboctou. From there it swings south, passing through Gao before reaching Niamey, and from there on a straight shot through Nigeria where it pours itself out across the infamous Niger Delta. The sense of life and freshness it provides the otherwise-dessicated Niamey can’t be underestimated. Like many cities with ‘soft’ features, it forms the heart- and the character- of what would otherwise be a stop well worth missing on a journey across the continent. Yellow Canola (Rapeseed) clashes with a cloud-spotted blue sky at the foot of the Remarkables Ranges in South Australia state. On a photographic road-trip through the area with my brother, we’d spent some time ooh-ing and aah-ing over the bright colours and beautiful contrast of the sun-soaked flowers. It was a perfect day for photography, and my biggest regret was that I hadn’t yet purchased a polarizer filter for my brand new Canon EOS 350D/Rebel XT, bought the day before we went on the trip. It would have made better use of the blue skies, but irregardless I was pleased with how this image turned out. South Australia is, in my opinion, one of the underestimated corners of this vast and varied continent. Full of quirk and character, there are a thousand dramatic landscapes to be discovered in a state that seems to receive very little tourism or international interest, and I for one can’t wait to head back for some more voyaging, camera in tow. I’ve always loved the open road. As a traveller I enjoy the reality of being on the move. So long as the wheels are turning or the jets are revving or the hull is slicing past the waves, I’m happy. California is like a traveller’s dream. A great wide expanse of spectacular and varied country, beneath a strong blue sky, connected by one of the world’s best networks of driveable roads. I spent five days driving around CA, and I loved it. Colourful boats are drawn up on a beach in Ile de Gorée. Gorée is a small island in the harbour, fifteen minutes’ ferry ride from Senegal’s capital, Dakar. Once a minor node on the network of the Senegambian slave trade, today the island is a tranquil little escape from the bustle and mayhem of one of West Africa’s largest cities. Although billed as a major hub of the slaving triangle of the seventeenth and eighteenth centuries, Gorée is considered by modern historians as insignificant, and most of the slaving that happened here was incidental to larger centres of activity. Despite this, the island continues to draw visitors to the slaving museum. It’s real charm lies in the peaceful and laid-back nature of its narrow streets. Colonial homes lean close together to provide deep, shaded alleys where the sound of footfalls echoing on cobbles mingles with the quiet hiss of breaking waves, the murmur of a sea-breeze, and the catcalls of a gull soaring overhead. After the frenetic chaos of Dakar’s winding streets, the industrious energy of the port, and the vibrant colours of its varied inhabitants, Ile de Gorée is an island not just in geography, but an island for the soul as well. Seen from a nearby hill, late autumn sunlight falls like gold vapour on downtown Edinburgh. My work takes me to a wide range of exotic locales in developing countries, but I rarely find myself in more sedate haunts. On this occasion, a few days’ R&R on the way out from an African posting gave me a chance to catch up with friends in the UK. I spent a couple of pleasant days in Edinburgh with old friends from University. In true fashion, the city was bitterly cold and swept with a wind that threatened to sear exposed extremities. Although I’m not a fan of winter in the British Isles, there is something about the cold that lends a sense of coziness when you’re cooped up inside a nice warm pub, with wind and rain hammering against the windows. I can’t say I miss it very often, but every now and again, a nice wintry afternoon sharing a pub with an open fire and a pint of Newcastle Brown Ale would go down very well indeed.